Doll clothes are often retro. Or classic. Or both. I thought a longer sharper collar is both retro and classic. It's also simple to sew. The pattern pieces will be in my next newlsetter. I am basically following the instructions for my beginner's sleeve dress, which are here. But I'm including complete instructions here too. And then cut the collar fabric cut 4 collar pieces. Sew shoulder seams of dress together. Sew shoulder seams of the lining pieces together. Sew collar pieces together. Clip corners and edges of collars. 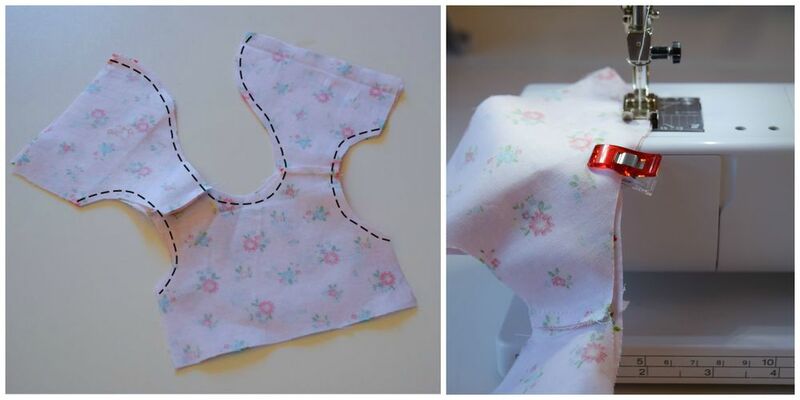 Attach the two collar pieces to the dress fabric neckline making sure they are centered. I baste the centers on first. As shown here. Stitch lining to main dress fabric, by starting at the bottom of the back opening, go up to the neckline, around the neckline and back down the back opening. When going around the neckline make sure you are stitching through the lining, the dress fabric AND the collar pieces. 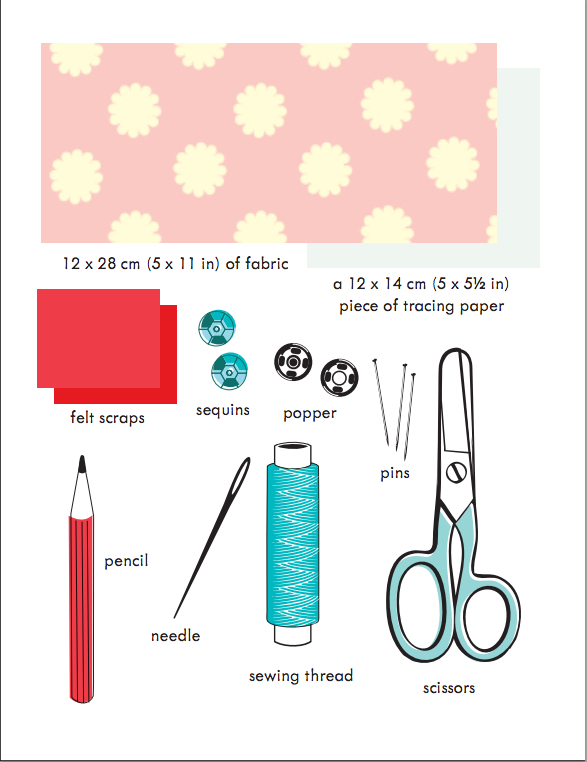 Sew dress fabric to lining at each armhole. This is to make sure they stay together when you attach the sleeves. Attach sleeves. See my easy sleeve tutorial if you are unsure how. These sleeves do not need gathering or easing. 2. Pin or clip sleevces to armhole edge. If you are feeling confident you can just sew and adjust while you are sewing. 3. Turn over and check that it looks okay. Sew side seams and hem. I'd love the pattern pieces! Sign up for my newlsetter and receive the base pattern set and keep up with all future pieces. This will be in the upcoming issue. This week I'll be adding a few more dolls and clothing sets to my Etsy shop. A few new things are already there. One is the Fancy Nancy rag doll and she comes with an extra Fancy extra outfit. Also if you want to buy a Harry Potter doll for the holidays contact me (form for contacting me at the end of this post). I am taking one or two more orders. The sweaters take a long time to make and I am close to my limit. In addition to Fancy Nancy, I've added a African American doll with a new darker skin tone. And a new clothing set. I've been busy. Really busy. I have lots of new orders, but also in between I have been trying to make a few new dolls to add to the collection. They should be in my Etsy shop by the end of next Tuesday. And speaking of my Etsy shop... if you are interested in a Phoebe&Egg doll for the holidays, please contact me, so we can talk schedule. I am already into October. There's is a contact form at the end of this post. Wrap dresses are wonderful. They are easy to make. There are many ways they can be adapted. They are great if you only have a small amount of fabric, you can just use it for the bodice, like I did. But best of all, they are very forgiving as far as sizing goes. If your doll is wider, the bodice wraps less. If your doll is narrow, the bodice wraps more. If your doll is short, just make a shorter skirt. The pattern pieces for all four dolls will be in my next newsletter. At the bottom of this post I will include a sign up form. 1. Cut out two bodice sets and one skirt. The dress can be all one fabric or two like I've done. 2. Sew both sets of shoulder seams. 3. Sew two bodices together, right sides together. Sew at armhole and around the neckline. 4. Next you need to sew the side seams. Start by pinning the armhole seam to the other armhole seam, right sides together on one side of the bodice. This is similar to how you sewed the side seams in the reversible dress. Press and your bodice should look like this (below). 5. Finish vertical edges of the skirt. 6. Run two rows of gathering stitches along the top edge of the skirt. 7. Gather skirt to fit bodice. Have less gathers on the side of the front that will be underneath (one side will wrap over the other). Pin the skirt to one layer of the bodice as shown below. See below how the right side has less gathers. 8. Slip stitch lining to top of the skirt seam. Sign up for my newsletter. It includes these pattern pieces and all of the base patterns. If you have already signed up, the newsletter with the pattern and other goodies should be in your inbox by the end of the week. Phoebe Celebrates spring with new clothes! With this new outfit, Phoebe is now ready for a day strolling Central Park, a visit to the Natural History Museum and tea and macarons. Red 100% wool felt Mary Janes with shell buttons.